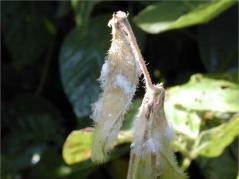 URBANA, Ill. – The fungus that causes white mold on soybeans and other crops behaves differently in the United States and Brazil, according to a new study completed at the University of Illinois. There is concern that if Brazilian strains were imported or if U.S. strains became adapted to warmer temperatures, southern soybean farmers in the U.S. could face the disease. Due to its prevalence in the north-central region, white mold is often listed as one of the top ten soybean diseases in the country, and can result in significant yield losses. To validate observations from the field, Hartman and his team conducted laboratory tests to evaluate the ability of U.S. and Brazilian fungal strains to cause symptoms on soybeans, common beans, and canola plants with and without the fungus being exposed to cold temperatures beforehand. Brazilian strains produced spores and infected plants without exposure to cold, but U.S. strains did not. “Brazilian isolates formed spores right away,” Hartman says. The researchers wondered if the Brazilian strains were also better adapted to heat than U.S. strains, but they weren’t. All strains, regardless of their origin, were more likely to produce spores at a pleasant 68 degrees Fahrenheit than at 86. The result may be good news for southern soybean farmers where the summer soybean season routinely reaches high temperatures. But Hartman notes that a few isolated outbreaks have been documented south of its usual area, in the St. Louis, Missouri, area and in Kentucky. The article, “Mycelial growth, pathogenicity, aggressiveness and apothecial development of Sclerotinia sclerotiorum isolates from Brazil and the United States in contrasting temperature regimes,” is published in Summa Phytopathologica. Researchers from Embrapa Soja in Brazil, Agricen Sciences, U.S. Department of Agriculture, and U of I contributed to the study.